Big Daddy Wilson will be performing at the Brass Monkey in Cronulla on April 2. Image: Supplied. "Love is the key," croons Big Daddy Wilson when I ask him what he hopes his fans will take away from his gig at The Brass Monkey on April 2. 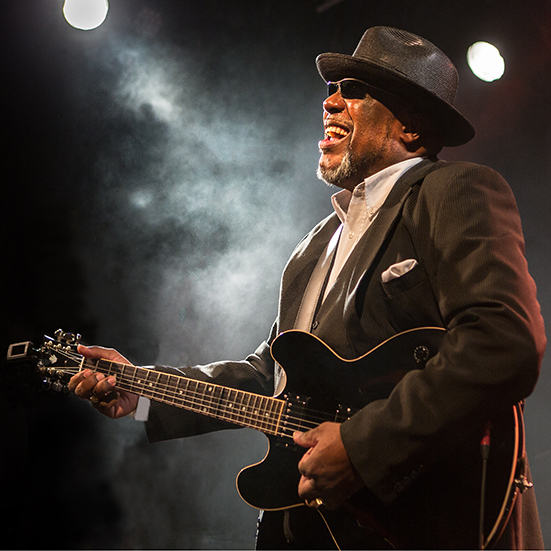 The travelling German-based African-American bluesman, who grew up working on cotton and tobacco plantations in the small town of Edenton, North Carolina, says he hopes those attending the gig in Cronulla will "feel the love". "I want people to walk away from my gigs feeling connected. I want them to feel love. I want them to feel respect. I want them to feel hope," says Wilson. The 60-something singer says there's something very primal about his passion for singing the blues, which he wasn't exposed to as a child. "I didn't hear any blues when I was in North Carolina. I grew up listening to gospel and country music. I was a young man serving in the US Army when I went to Germany and that's where I saw my first blues concert. I knew right then and there that that music was for me. It was my calling. From that point on, I listened to the blues, played the blues and sang the blues," says Wilson. Big Daddy Wilson - named so because of his stature - says he began to write songs based on the blues because it connects him, like tacks on a world map, to his African-American roots. Producer Eric Bibb who collaborated with Big Daddy on his latest album, Time, describes Big Daddy's soulful baritone as "being baptised in the river of African-American song". So what does that river sound like as it roars past? "That river sound like a lot of history. That river tells a lot of stories. Of course, life is the river; the river is life - all those twists and turns during the journey. My story is about the bad and the good things but mostly about the good. I try to keep it positive. That river is a healing river. When you sing the blues, it fixes what's broken," says Wilson. Wilson says playing the blues feels very instinctive and he hopes those listening to his music feel as moved as if they were sitting on the front porch of his home in the old cotton belt of America's Deep South. As well as writing about challenging subjects such as his poverty-stricken childhood and his forefathers who were sold into slavery, Wilson writes of his enduring love for his German wife, Anna. "A lot of my songs have a deeper message. Even though I write stories about being poor, I had a very rich childhood, so those stories are filled with hope. Those hopes are mixed up with the culture, the gospel, the spiritual -- the stories I grew up listening to as a young boy," says Wilson. "I fell in love in Germany so a lot of my songs are also love songs that I dedicate to my wife Anna. I have been writing her love songs for 30 years," he says. As well as being inspired by some of the great old-school singers of the '60s, Wilson is influenced by artists such as Taj Mahal, Keb Mo and his producer friend Eric Bibb. Although he has not lived in Edenton for more than three decades, the mayor presented Wilson with the keys to his hometown in 2013 when he declared September 13 to be Big Daddy Wilson Day. "That was great for me. Another honour and privilege was for me to be able to share the stage with legends such as Louisiana Red, Eddie Boyd and Champion Jack Dupree, who also call Europe home," says Wilson. Wilson was also invited to sing at the premiere of the blues documentary, The Soul of a Man, by Wim Wenders in 2003. "My songs are stories that my forefathers used to tell us about their life and experience. My story is their story. It's a southern story. It's a story of the poor, the marginalized and my great hope is to spread my wings and tell my story by spreading positive vibes. When I say 'love is the key' I'm trying to say we are all connected. The blues helps me reach out beyond the black community and spread positive vibes," says Wilson, who has won many music awards in Europe.